I’m here at Rocky Mountain National Park for the next week for their 2nd annual Night Sky Festival. The rangers invited me back to give a talk and a night sky photography workshop. It’s a chance to come back to the park where I was an artist-in-residence in 2013. The interpretive rangers have generously allowed me to stay in the William Allen White cabin, where the artists stay, since it is vacant for a couple of weeks. 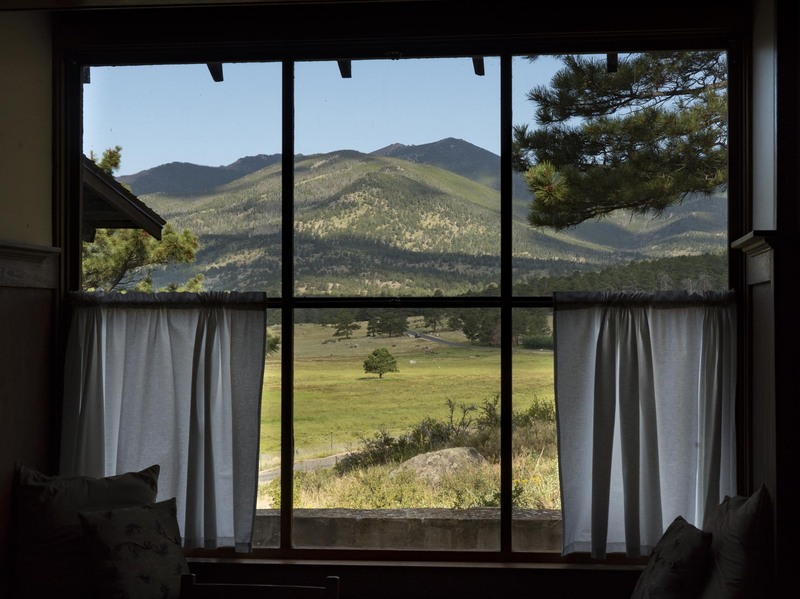 It’s hard to beat the views from the cabin, either from the large main room window looking west towards the mountains or from the expansive covered porch looking south towards more mountains and Longs Peak. We’re in the Moraine Park section and there is a vast meadow at the base of the mountains. This stay will allow me to re-visit some of the locations I was at in 2013 and shoot more of the incredible night sky here. I arrived Monday and both night so far have been clear. I had a mild scare last night at Sprague Lake around 1:30 a.m. as the moon was rising. I heard something running a few steps by the shore and then a huge splash in the water. Some splashing around, almost like someone swimming. It seemed to be right in front of where I was photographing a dead log and the lake. The splashing continued off and on with a few grunts. I shot one more picture and decided to head out, not wanting to see what kind of animal was taking a midnight swim. View from the cabin’s main room. The dining table is here, so you get this great view at all meals. 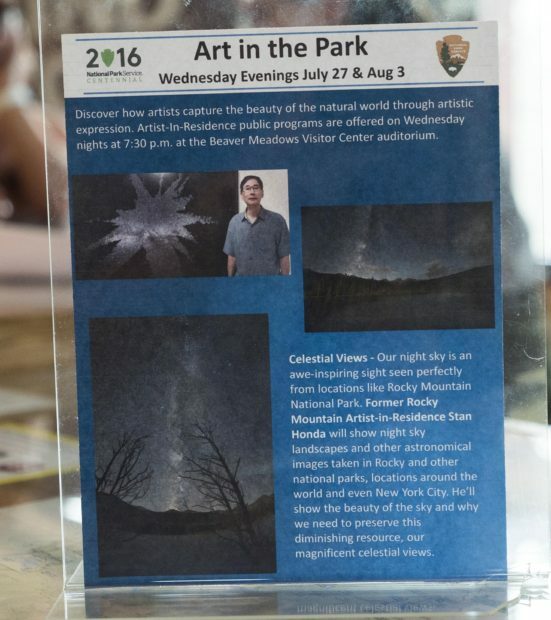 They made a nice flyer on display in the Beaver Meadows visitor center where I’ll be giving talks each Wednesday as part of the scheduled Art in the Park series.